I've always had a thing for elephants, and I don't exactly know why. All my awesome goodies from iomoi feature Ling the elephant; I have lots of vintage belts with elephants on them. Grey is one of my favorite neutrals and I have been obsessed with British-ruled India and riding elephants and all that goes along with them. I don't need to reiterate my love for this elephant side table, and I even "adopted" an elephant for my sister for Christmas! So, in a crazy twist of fate, when I came across this elephant-inspired jewelry, I was floored to know that it benefitted the same Wildlife Trust where my sister's pet elephant resides! (Side note: we get monthly updates on how our little elephant is doing. So cute. She's kind of a punk.) 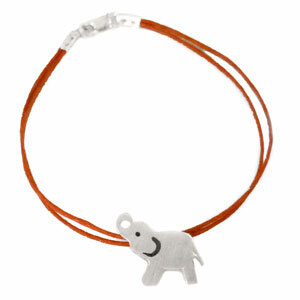 20% of the sales go to funding for the David Sheldrick Wildlife Trust in Nairobi, Kenya. Best part? 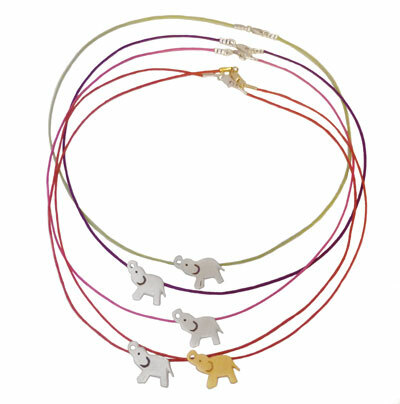 Elephants are symbols of good luck! Who wouldn't want to have this adorable piece of good luck on their wrist or neck? Who is the woman behind these inspired designs? That would be one Vanessa Amalia Raptopolous of Vanessa Amalia jewelry. She focuses on designs that have significant meaning for the wearer, whether you are a believer in horseshoes, fleur-de-lis, hamsas, or four-leaf clovers. Have a weird good luck symbol of your own? You can even ask Vanessa to help you design a custom charm. My dilemma is now figuring out which cord and which elephant to pick!